Create a bright, blooming bulletin board while encouraging students to reflect on how they have grown this school year. Product includes a no-prep version as well as a craftivity version if your students are up for a little cutting and gluing. Each flower and leaf option reads "I grew this year by. 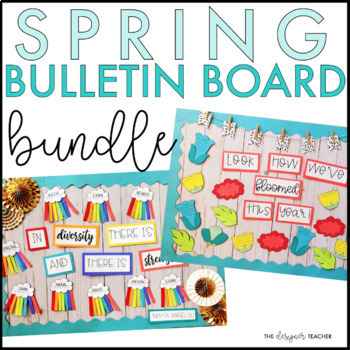 Save 20% by purchasing this bundle of my four spring bulletin board kits! You'll have fresh & fun bulletin board kits that will last you all spring, with options suitable for K-8. Themes include diversity, environmentalism, mindfulness, and growth. Each kit includes multiple versions to best suit your students, including no prep versions and templates with standard and primary lines. Please note that all of these kits are also included in my Monthly Bulletin Board Bundle. Don't forget to follow The Designer Teacher for updates and leave feedback to earn TPT credits!